The last Chevy Impala wasn't what you'd call a good car. It wasn't really even a mediocre car. It was just a car you'd rent on a business trip and never consider buying for yourself. 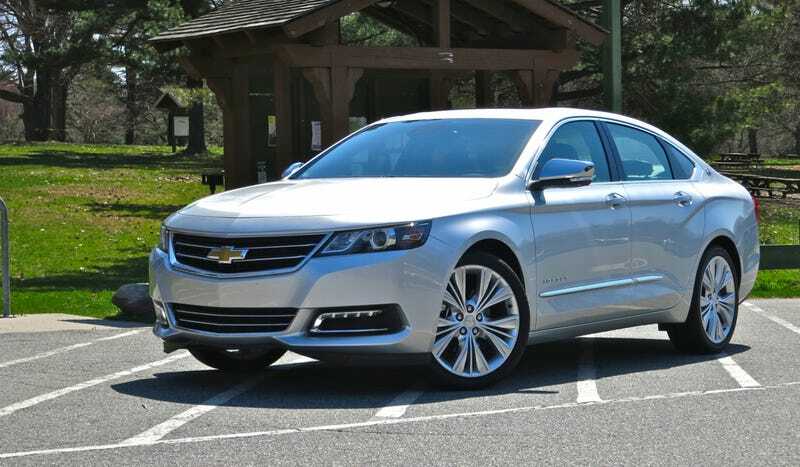 Chevy wants all that to change with the 2014 Impala. That means the new Impala better be pretty damn good. Chevy's last Impala was predominantly a fleet vehicle, which is why you typically see them driven by flabby tourists with out of state plates that look like they're really lost. Nearly 70 percent of them were sold to fleets, with just 30 percent of people deciding to buy one for their own. That says a lot. For 2014, Chevy wants to flip that and have the vast majority of sales go to retail, not fleet customers. It also won't be going to millennials. It'll be going to the opposite of millennials. This is the car millennials will ride in while their parents take them out to dinner, because they still live at home. They'll also be wearing a fedora, beret, or some other sort of unique hat that is "cool" and they listen to bands that probably don't actually exist yet. Oh, I'm going off on a tangent. Sorry. Anywho, the bulbous, boring body is gone, replaced with a much more contemporary shape. From certain angles it can be thought of as rather Audi-ish, and from the rear I even thought it was Tesla-esque. I do think that the rear-overhang is a bit long, but that does help it accomodate a trunk that could probably fit another Impala inside it. The interior is also a pretty massive step up from the plastic and cloth hell of before. The car I drove was a top-of-the-line LTZ, which means it had loads of leather everywhere, heated/cooled seats, MyLink entertainment system, nav, satellite radio, and all other sorts of doo dads and gizmos like blind spot warnings and other collision warning type things. That also comes at a price. The base Impala with the 2.5 liter I4 starts at $27,535, but the top-of-the-line LTZ was $39,510. Thankfully, it also felt like a $40,000 car. In fact, it's a better place to spend time than any Buick sold here today, which once again makes me question the point of Buick in America. It's a comfortable place to be as a driver and I could imagine myself relaxed on a longer road trip. Our backseat passenger, a GM PR man, couldn't stop complimenting those seats. He might have been biased. And it's also quiet. There is just the slightest hint of wind noise to let you know that "hey, you're in a vehicle which is currently moving through the air at a decent rate of speed." I did find MyLink a bit confusing; I couldn't switch to XM from FM, and I'm not an idiot. The interface, with a large screen to control most functions, reminded me a lot of CUE in a Cadillac, which is both good and bad. So what is it like to drive? Don't expect it to be evocative or a handling machine. It is not a Porsche 911. But it isn't an unfeeling land boat for insanely old men that love landau tops. Steering is light, but not overboosted, which I liked. What was impressive was the ride quality. Our drive out of Manhattan saw a lot of rough roads and suspension joints on bridges, stuff that typically upsets the ride of a car. In the Impala, you could hear the joints and vaguely feel them, but it wasn't disturbing. The great ride coupled with the low noise/vibration/harshness makes it easy to drive faster than you intended to. That just goes to show how comfortable the new Impala is, and how solid it is at high speed. This car is gloriously comfortable. It also isn't slow... or fast. It's perfectly adequate. The 305 horsepower DI V6 under the hood of the LTZ was fine, as was the six-speed transmission. It did have a manual mode on the gearbox, but I'm not sure why. Nobody who drives an Impala wants to shift their own gears. It's totally unneeded. There is one thing the Impala lacks, and that's character. To me, it didn't feel like I was in something special. The Impala is transportation for people that want to get from point to point without being bothered. The difference is that this new Impala is a car people will actually want to buy and spend time in, not something they rent, hate for four days, and then never see again. And that means that the Avalon, Taurus, and Maxima finally have a credible competitor from Chevrolet. That's worth celebrating in itself.